Jumbo Postcard with Removable Magnet. What is a Magnet Mailer Postcard? Magnet is held in place with fugitive (removable) glue. 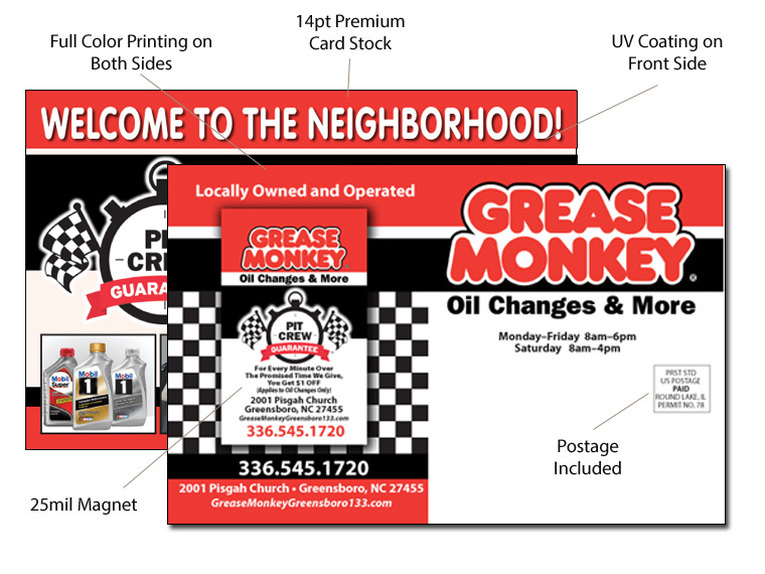 A magnet mailer postcard is a traditional direct mail postcard with a removable fridge magnet on the back. The magnet is held to the postcard with removable glue. This glue is strong enough to withstand the mailing process but is easily removed by your customer. ​A magnet mailer postcard is more effective than a traditional postcard because when the magnet is removed and placed on the fridge, it becomes a permanent "billboard in the home". It's ideal if you're looking to create awareness of your company, generate immediate sales or maintain top-of-mind visibility. Our magnets are printed on 25 mil magnet stock. They are nice and heavy and designed to hold several pieces of paper. Beware of other companies using digitally printed lightweight stock (15 or 17 mil) as they are too flimsy to actually work! They'll bend and crease when being removed and will likely end up in the trash. Our direct mail postcard with a magnet consists of a heavy direct mail postcard (14pt) with a 25 mil full color magnet attached to the back with removable glue. Request samples of our magnet mailer postcards and see (and feel) the difference yourself. All of our magnet mailer postcards are produced at our facilities (we're located in northern Illinois). Following receipt of your artwork, we print the postcard and magnets, affix the magnets to the postcard and prepare them for the monthly mailings. Additional magnets can be purchased at discounted prices.